When we come to one another and say, 'Forgive me' it will not mean, if you answer 'Yes I do' that nothing that was wrong between us is annihilated, exists no more. But it means 'I accept you as you are, sinful, a wound in my flesh, a wound in my heart, a problem in my life — but I accept you and I will carry this acceptance, and you, throughout life, and pray for God's blessing to be on you and pray for God to heal both of us, that I should become such that I do not lead you into temptation, be the cause of your own fall. The weeks that have preceded Forgiveness Sunday are weeks during which, in the form of stories that actually took place or of parables, we are presented with the basic sins, the basic brokenness of ours. This was the time when we should have examined ourselves deeply, deeply; stood before God, at times with horror at what we have accepted to be, at times with pain at what has become of us in the consequence of the life which was ours. 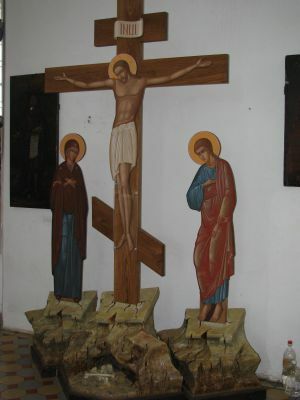 When we will stand together at the foot of the cross on Great Thursday night or by the tomb of Christ on Great Friday, we must realise that this has happened because of each of us — not for the totality of mankind taken wholesale, but because of each of us. Christ died for each of us. And we must at that moment bring to Him ourselves in such a way as to show Him that for us, His death upon the cross was not in vain. And then move towards the Resurrection to rise with Him, to rise in exultation, to rise in gratitude, but to rise also renewed, a new creature — not perfect yet, because we have years during which we will have to follow the same path step by step, again and again, until we reach our full maturity and can enter into God’s Kingdom. And carrying the burden upon our shoulders means primarily to accept my neighbour as he is, hoping that things will change, praying for him or for her that the grace of God should transform, transfigure this person — but also me, because what judge am I of another’s sins while I am a sinner, while I am a temptation, a wound in the life of so many others? So let us make this attempt. When we come to one another and say, ‘Forgive me’ it will not mean, if you answer ‘Yes I do’ that nothing that was wrong between us is annihilated, exists no more. But it means ‘I accept you as you are, sinful, a wound in my flesh, a wound in my heart, a problem in my life — but I accept you and I will carry this acceptance, and you, throughout life, and pray for God’s blessing to be on you and pray for God to heal both of us, that I should become such that I do not lead you into temptation, be the cause of your own fall. Let us therefore pray together during this service, bring to God true repentance of what we are and what we have been, but also bring one another to God. Moving towards Calvary, moving towards the resurrection has been compared by one of the ancient writers to travellers who board the same ship. They will never arrive safe if there are quarrels between them, if they are not at one. Let us be at one, with Christ who is at the rudder, with Christ who has given His life for each of us, however difficult we are for one another. And when we say, ‘Yes, I forgive,’ it means, ‘I accept you as you are with whatever consequences to me. I accept you, and give my life as an offering for yours.’ Amen.